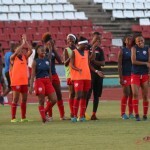 Home / Volley / Global Football / Showdown at the Ato Boldon Stadium; can T&T U-20 women outgun Haiti? 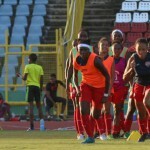 Showdown at the Ato Boldon Stadium; can T&T U-20 women outgun Haiti? 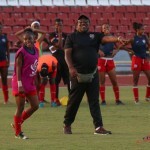 When Caribbean rivals Trinidad and Tobago and Haiti meet from 6.30pm today in a CONCACAF Under-20 Women’s encounter, there will be, coach Jamaal Shabazz promises, fireworks. Addressing the media at yesterday’s press briefing at the Ato Boldon Stadium in Couva, Shabazz compared the match-up to what happens in the classic western, High Noon. 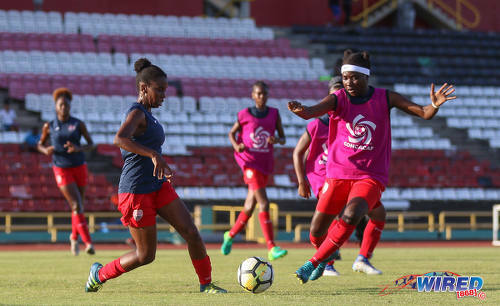 Photo: The Trinidad and Tobago Women’s National Under-20 Team trains at the Hasely Crawford Stadium on 9 January 2018. On Tuesday, Shabazz had lauded the progress of Nathifa Hackshaw and Aaliyah Prince, the two youngest members of his 22-strong squad. But the coach made no reference to the events of two years ago when a Marlon Charles-coached team was outgunned 22-0 by the United States at the CONCACAF Under-15 Championships in Orlando. He made no mention of the possible after effects of that experience on the pair, who were members of that hapless Under-15 team. Will they be gun shy? Shabazz reckons not. 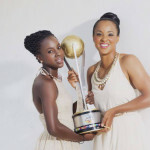 According to him, this “Young Women Warriors” squad are better equipped to deal with the rigours of international football. And he feels that they have what it takes to pass the stern test to which they are likely to be put by today’s opponents, who are under the guidance of Marc Collat, a former youth team coach in France. “We have seen two games with [Haiti] on tape and we know they are very skillful,” Shabazz sought to reassure the media. “They have a couple players who we can consider outstanding. And technically and tactically they are at the same level as us. 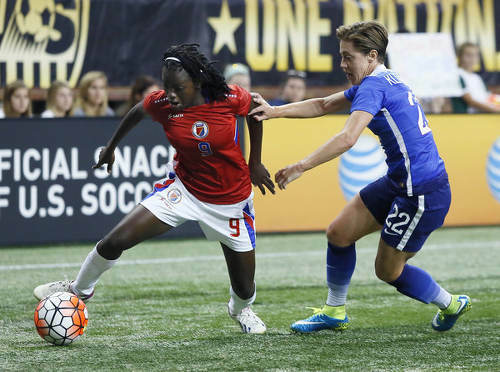 Photo: Haiti captain and France-based attacker Nerilia Mondésir (left) in action against the United States. 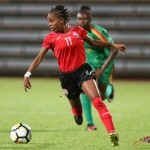 Haiti are skippered by Nerilia Mondésir, who plays for French club Montpellier, and is, along with US-based midfielder Danielle Étienne, one of only two overseas-based players in the Haiti squad. Shabazz and his staff were denied any new insights into the strengths and weaknesses of the current squad by the absence of Haiti’s liaison officer from yesterday’s news conference. The absentee was supposed to act as interpreter at the briefing where Collat and Mondésir spoke. The visitors were warned by Shabazz that they were in for a torrid time and that their hosts were expecting to get as good as they gave. 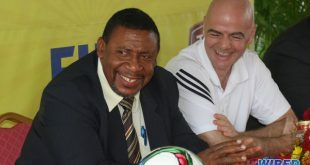 He suggested that both teams were likely to choose the first option in today’s game. 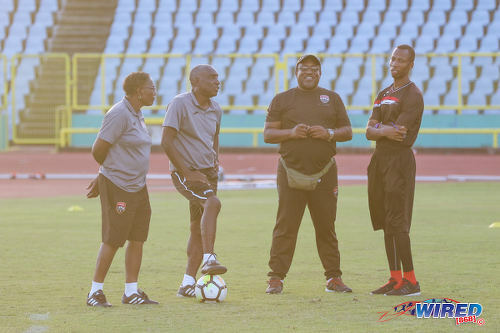 Photo: Trinidad and Tobago Women’s National Under-20 coach Jamaal Shabazz (second from right) talks to fellow technical staff members (from left) Desiree Sarjaent, Marlon Charles and Saran Joseph during practice at the Hasely Crawford Stadium on 9 January 2018. 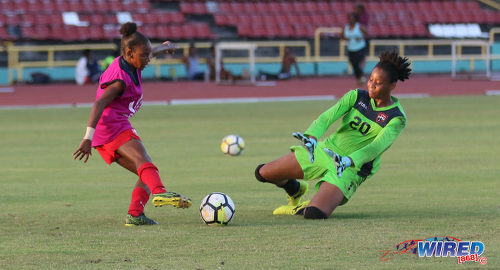 If Prince might prove to be more than a little firecracker up top as was the case both at Under-15 and Under-17 level and skipper Natisha John will take no prisoners at the back, ‘savage is certainly not a word one associates with Ranae Ward, who is a smooth operator in the middle of the park. But Shabazz is confident about how the girls will acquit themselves. John certainly understands that she has “ecstatic and excited” bunch of players under her and she knows that her main leadership role will be to provide consistent motivation and a calming inside the dressing room and outside on the field. Photo: Trinidad and Tobago midfielder Ranae Ward (left) and defender Natisha John challenge the ball during Women’s National Under-20 Team practice at the Hasely Crawford Stadium on 9 January 2018. Whether the approach is savage or gentle, Shabazz made it clear that the most important thing is to come away from today’s game with maximum points. Particularly as he has already been put on notice that the Canadians, T&T’s opponents in the second round match-up on Saturday after taking on Costa Rica today, are not in the two-island republic on holiday. Canadian skipper Gabrielle Carle, who won a bronze medal with her country’s senior team at the 2016 Rio Olympic Games, was the one to deliver the warning. 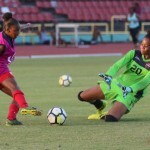 The Canadians were runners-up at the last CONCACAF Under-20 Championships and, although coach Beverly Priestman is expecting none of their opponents to clear a path for them, she is confident that her team can take the fight to any opposition. Photo: Canada forward and prodigy Gabrielle Carle (centre) is the captain of the current National Under-20 Team. Seven of the Canadian players have already earned national senior team caps, and promising 16-year-old attacker Jordyn Huitema is expected to be a dangerous customer up top. 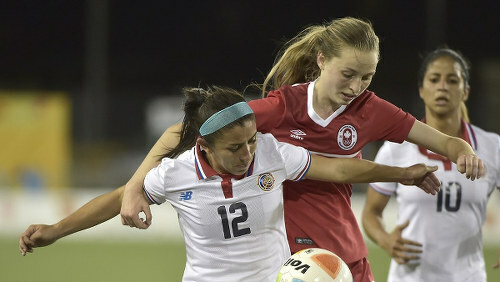 On her senior team debut in June last year, Huitema bagged a brace in a 6-0 mauling of Costa Rica to become the second youngest goal-scorer in Canadian women’s team history. “Los Ticos,” will be hoping that history doesn’t repeat itself today. But Priestman, despite taking nothing for granted, remains fairly confident about the likely outcome. After this afternoon, John, Shabazz and the rest of the T&T contingent may be doing some brainstorming on the threats of Carle and Huitema. But for now, the focus of the Young Women Warriors is on the immediate Haitian obstacle. Photo: Attacker Aaliyah Prince (left) attempts to dribble goalkeeper Klil Keshwar during Trinidad and Tobago Women’s National Under-20 Team practice at the Hasely Crawford Stadium on 9 January 2018. Shabazz has already pointed out that today’s challenge is not quite like the life-and-death situations he has faced but he knows how critical today’s three points are to his team’s future welfare. “I think this is the most important game for us,” Shabazz said. “(In) this first game, it’s important for us to try and get our noses in front, to start off on a good note and put ourselves in a good position. Where they are enthusiastic, their coach is philosophical. But the time for talk is over. And six and a half hours past high noon today, T&T expects the young ladies to take the field at the Ato Boldon with all guns blazing. True dat Haiti is ah serious teamJamal yallyuh does host boi? Poor very poor does girls look like they need a coach. But my Prof Jamaal Shabazz ah like how you does be answering dem questions when asked eh the fella asked you about the USA preparartions playing against France and other real football countries eh compared to our preparation eh, Well I am still waiting on your reply eh because the one you gave didn’t make any sense at all. Them really good yes. Looking at Canada vs Costa Rica now. I only realised this when i started to watch the youtube stream from concacaf and heard Terry Fenwick and Vidya Ramphal on commentary. Games apparently also being shown on Flow Sports. Are the games being streamed online? Is this the only International tournament to be hosted at 1 stadium? I have never before heard of this. I’ve seen Concacaf do this before [think it was Central America] but it was an artificial surface. Nah. Even with artificial surface with Panama and Costa Rica, there were always two venues. Sheldon Scipio is right. Lasana Liburd you have the schedule of games for next week? Trinidad and Tobago v Costa Rica, Group A, 6.30pm. Very. They wouldn’t subject adults to this kinda thing. But CONCACAF has no issue having kids do it. and all the games at 1 venue…… our grounds are notorious for getting cut up easily at the slightest hint of rain… far less if the rain actually fall… who’s genius idea was this…… oh never mind…. Ian… I wondered the same but was told it was requested by Concacaf since they were also scaling back. Can only assume it was. CONCACAF requested the tourney play ALL games of an international tourney on 1 GRASS field? well ok….. Let the games begin….